Fountains are inherently calming and cooling, and they've formed the hearts of plazas throughout the world and history. Each one has its own character and personality--a story to tell... a culture to commemorate. Be they elegant or whimsical or artistic, they're gifts to a gathering space. This fountain at Tokyo Disney Sea's Arabian Coast is is one of many Disney fountains, but being in one of only two Disney themed lands that exclusively celebrate Middle Eastern culture (EPCOT's Morocco Pavilion being the other, though some of the Adventurelands around the world dabble a bit), I find it more unique. 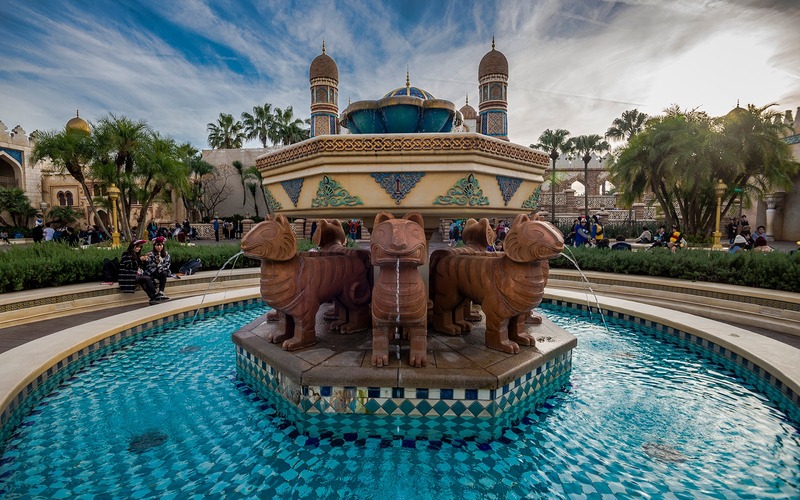 The wood carvings of the tigers coursing water into the tile basin present a more exotic look that's a fun contrast to most other Disney fountains, and set amid the spectacular "palace" courtyard of the Arabian Coast, it's a central hub for guests to rest and take in the scenery. Here, despite the bustling hive of energy all around, everything feels at peace. A beautiful fountain stands in the middle of an oasis in the Arabian Coast.